A Playa del Carmen honeymoon is ideal for anyone who likes the beach, water sports, outdoor adventures and an exciting nightlife. 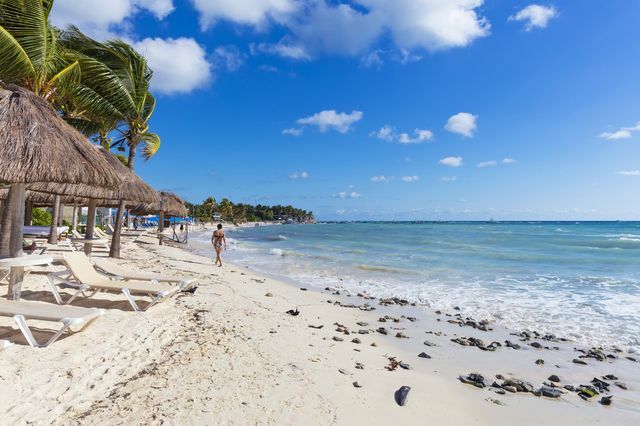 If you are a free spirited outdoor enthusiast who enjoys tropical climates and modern entertainment, then a Playa del Carmen honeymoon is perfect for you. Located in the heart of the Yucatan Peninsula’s Riviera Maya, this coastal resort has quickly become one of the best places in Mexico to visit. Playa del Carmen is an affordable vacation spot for anyone who likes the beach, water sports, outdoor adventures and an exciting nightlife. The luxurious beaches are a haven for snorkeling, scuba diving, boating, tubing, jet skiing and swimming. Once you have arrived, you will quickly find an abundance of exciting things to do and great places to see. Whether you want to spend the day lounging at the beach or touring the area, you will always find something fun to do on your Playa del Carmen honeymoon. The best time to enjoy your Playa del Carmen honeymoon is during the low season which runs from October to May. The temperatures are consistently hot and the precipitation is low. The rainy season is at its lowest in March and April. You will find it more affordable to go during this time. High season runs from May to September. While this time of year is also consistently hot, it is also hurricane season so there is a lot more rain and storms. XPLOR Adventure Park: With ziplines, caves, rope bridges, ATV’s and river rafts, this park is a thrill seekers dream. Xenses Park: This relatively new attraction will quickly awaken your senses as you explore the 15 different activities during your Playa del Carmen honeymoon. Yal Ku Lagoon: If you enjoy observing tropical fish in their natural habitat, the Yal Ku Lagoon is the perfect place to go snorkeling. Chichen Itza Tour: Explore the mysteries of the Mayan at Mexico’s most famous ruins. This historic place will leave you breathless. Buggy Jungle Adventure: Take your own tour visiting smaller villages and cenotes while driving through the Mayan jungles in a rented buggy. Xel-Ha: After taking a guided tour through these ancient seaside ruins, you can enjoy the many activities in this beautiful area offers. Catamaran Cruises: Sunbathe, snorkel and enjoy refreshing drinks while taking in the beautiful coastline during a full day cruise on one of these popular boats. Cirque du Soleil: One of the most renown acrobatic circus shows, you can go to see the show only or make an evening of it with a dinner and show package. Coco Bongo: If you want to explore the area's nightlife during your Playa del Carmen honeymoon, this club is a must visit. It has the best music, drinks and live entertainment ever housed in one place. Best honeymoon all inclusive in Playa Del Carmen? Any Playa Del Carmen Honeymooners? Mexico, here we come!